Guest editorial. 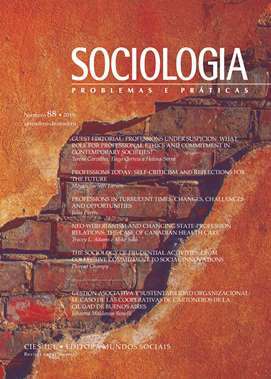 Professions under suspicion: what role for professional ethics and commitment in contemporary societies? The rising distrust and the surveillance over expert knowledge highlights how the professions and societies maintain a paradoxical relationship: the latter both needs as much as it suspects the former. This tension requires a sociological reading able to clarify the role of ethics and professional commitments. This constitutes the underlying thread for this thematic dossier. Within its scope, readers shall encounter theoretical and empirical contribution that enable a better interpretation of the relationships between professions and societies and thereby better grasping the processes that generically frame the ideas around the suspicion of the professions.